TextNow [iTunes Link] is an iPhone application created by Enflick that allows you to send and receive texts on your phone for free. The app uses your iPhones 3G or WiFi connection to send messages, allowing you to in turn save some cash by not using the text plan provided from your mobile phone provider. 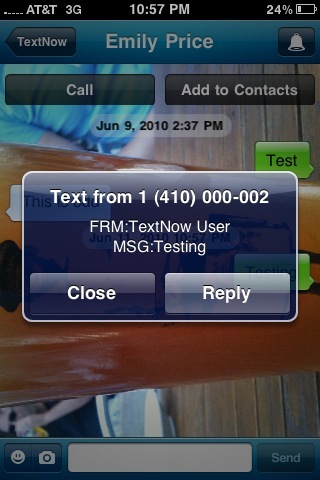 Overall, I have to say I was impressed with TextNow. The application allows you to use your existing contacts list on your iPhone to send text messages, and offers you your own TextNow email address that contacts (such as grandma), who might not have texting abilities can use to send a message directly to your phone. One thing I really liked about the application is not only can you send messages to people who do not have TextNow on their phones, you can also receive messages from people as well. The recipient of a text message from TextNow can respond to that message, and it will pop up on your phone, similar to the way it would if you were receiving a traditional text message. On the downside, when your friend receives a message from you, your number will show up as an awkward series of numbers, so if you don’t identify yourself in your text then your friend might choose to not respond to you. In addition, while you’re not being charged for sending the message, your friend will be charged for receiving a traditional text message unless they decide to download TextNow onto their mobile phone as well. Other features of the app include the ability to customize your text messaging wallpaper, ringtone when you receive a new message, and color scheme, as well the ability to add a custom signature that will appear at the end of each message you send. 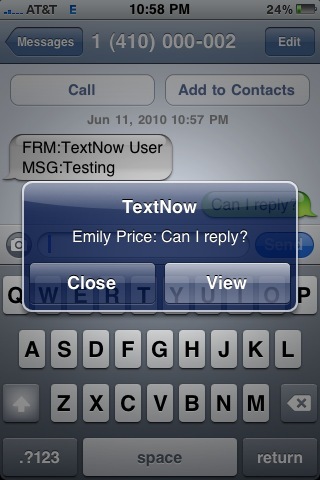 TextNow is available now in the iTunes store for $.99. Your original purchase of the app includes 3 months of service. After 3 months you are required to pay a subscription fee of $3.99/mo or $7.99 for life in order to continue using the app.